God, do I love this movie. 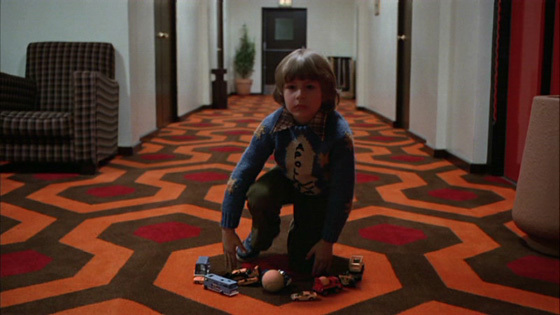 For someone that considers themselves a huge horror fan, I don't take this lightly when I say that Stanley Kubrick's The Shining is my favorite horror film of all time. The tone, the characters, the story that unfolds, all of it add to the perfect film. Jack Nicholson's performance is truly a spectacle to behold and Shelly Duvall is equally captivating in a role that so few people give credit to. Having Kubrick mentally harass and torture her for her performance is something we'd likely not see nowadays, and hasn't really earned her any accolades in regards to the role. But to those that understand the process, there's an appreciation that exists for her role. I understand why others don't dig it -- I was in the same boat several years ago -- but now I find it fascinating and one of my favorite female performances ever. I usually try and seek out the books for films that I enjoy but I've never brought myself to dive into King's opus. I think part of that has to do with the fact that King himself doesn't like Kubrick's film. I can't seem to comprehend how it is that someone could have such an aversion to such a perfect piece of cinema. If I read the book will it ruin my view of the movie? Or will it just ruin my view of the movie and make me dislike all the things that I used to like? It's always seemed like a bit of a no-win scenario for me. One day I'll get to it. Until then, I'm fine with being absolutely obsessed and fascinated by this classic. Every time I watch it, fearing that it may lose some of its charm, I'm then blown away by the film in all new ways. And that's really all I could ask for in a movie.